Do you know anybody – or have you heard of anybody – who has gotten banned from Amazon Associates? It’s not fun! It’s never happened to me personally. But I’ve known a few people in my internet marketing circles over the years who it has happened to. And from what I hear – it’s not very easy to get re-instated on that same account. It’s better to just NEVER get banned in the first place. Have you ever actually taken the time to read through all of that? A disclaimer like this MUST appear on any page that links to Amazon with your affiliate tag. To make this easy – I’ve always just placed the entire disclaimer, word-for-word, in the site footer. I’ve seen lots of sites that hide it only on their Disclaimer page and put a link to the Disclaimer page in their footer – but I’m not entirely convinced that is considered sufficient. I’d rather play it safe and place the full text in the footer so it shows up on every single page on my site. In other words, You CANNOT use or display Amazon star ratings on your own website or blog unless they are obtained directly through the Product Advertising API. The only exception I can think of is to mention in your text something like this… “at the time this post was written, [this product] had an average rating of over 4 out of 5 stars from more than 500 reviewers.” The other way people get around this rule is to create their own star rating system. Many base their own star ratings on the actual Amazon ratings. As long as you don’t say so – you should be okay. Personally – I prefer to just avoid star ratings on my sites altogether. It’s easier to place a CTA button (super easy with AmaLinks Pro) within the post containing the text, See Ratings and Reviews on Amazon. This accomplishes your ultimate goal… getting the reader to click over to Amazon! And what about those Amazon reviews…? You CANNOT copy & paste Amazon reviews, word-for-word, and publish them on your website. The Amazon Terms of Service clearly state that you cannot do this. I, myself, made this very mistake when I was starting out as an Amazon affiliate. I had the common misconception that is was okay to do this as long as I linked to the source (the Amazon product page). That was a big no-no! One way that you can use Amazon reviews to enhance your content is to read through a bunch of the actual reviews and then paraphrase them on your site. Re-write a bunch of the good and bad (pros and cons) aspects and features of the product you are promoting – in your own words. In this case – it is okay to reveal that this information is based off of real reviews from actual Amazon customers. So, how do other plugins or tools get away with displaying star ratings…? I’m glad you asked! I wrote another full post about that right here – Can I Show Amazon Star Ratings on My Website or Blog? Within that post – I show you exactly how one other ‘leading’ plugin displays star ratings and why it puts your Amazon Associates account at risk of getting banned. This one is fairly difficult to comprehend and understand. This also happens to be one of the mistakes that I made when I was getting started using the Amazon Associates program. Luckily, I never got caught and I was able to fix my mistakes. Here is a link to the Trademark Guidelines for Amazon Associates. In a nutshell… you can’t use any Amazon marks or Amazon logos anywhere on your site except for the ones they specifically provide to you. In other words – you can’t Google search for an image of the Amazon logo then upload that image to your site and use it. An example of an instance where it IS allowed – when you place an Amazon widget on your site that includes the Amazon logo. Another instance are these approved “Buy Now” buttons that Amazon provides. Alert: It appears they haven’t updated that page or those buttons since 1996! Lots of affiliates still use those though… and we’ve got you covered in AmaLinks Pro if you want to use those. They’re built right in to the plugin! Displaying product images for Amazon products is allowed ONLY if the images are pulled directly from the Amazon API. You are NOT allowed to host Amazon product images on your site – meaning you cannot save an Amazon product image to your computer then manually upload it to WordPress. It is okay to use other images in your review post (Ex: your own pictures or images provided by the manufacturer) – but you cannot hyperlink such images using your Amazon affiliate tag. It IS suggested that you link images to Amazon using your affiliate tag – but you can ONLY do this with product images accessed directly from the Amazon API (super easy with AmaLinks Pro!). Here is a link to an Amazon Associates Resource Center page on How to Use Images. You can NEVER display pricing information for Amazon products on pages that link to Amazon using your affiliate tag – EXCEPT when accessing actual current prices directly from the Amazon API. This is another really common mistake that beginners make. The reason Amazon doesn’t allow this is quite simple to understand. Say you write a review post and publish a certain price for an item. Well… prices on Amazon change constantly! If one of your readers expects a certain price based on what you published on your site – then they get to Amazon and see a different price… this can be considered a form of false advertising. There are a few easy ways to get around this. One is to place a text link that says something like – Check Current Price on Amazon. An even better strategy is to place that text inside a beautiful and enticing CTA button (super easy to create with AmaLinks Pro!). Another cool option that AmaLinks Pro offers is something we call Showcase Boxes – which are essentially product information boxes. These have the option to display the current pricing, pulled directly from the Amazon API, right on your WordPress post or page! The price automatically updates when prices on Amazon are updated. 1) Can you use the word Amazon on buttons? YES as long you don’t use the Amazon logo or a font that looks like the Amazon logo. You can also use words like CHECK PRICE. 2) Do all images have to be pulled from the Amazon API? Yes they need to be pulled from the Amazon API. You cannot copy the url directly from Amazon. This is a trademark violation. You must get the image from the API or using Sitestripe. 3) What if we get an image off of a vendor’s site that looks exactly like the one on Amazon? You of course can use an image from the vendor but if it looks exactly the same, there is a chance Amazon may not know the source. Remain Compliant and Don’t Get Banned! Whether you’re an experienced Amazon Associate and you already knew all of this, or perhaps your brand new – it’s always good to review all of this information and stay up to date. These 5 areas listed above are only the few most overlooked and the ones that people tend to violate the most. There are many more rules and requirements spelled out in the Amazon Terms of Service. Here at AmaLinks Pro – we’ve taken special care and consideration to ensure that everything our plugin offers is 100% compliant with the Amazon Associates operating agreements and policies. 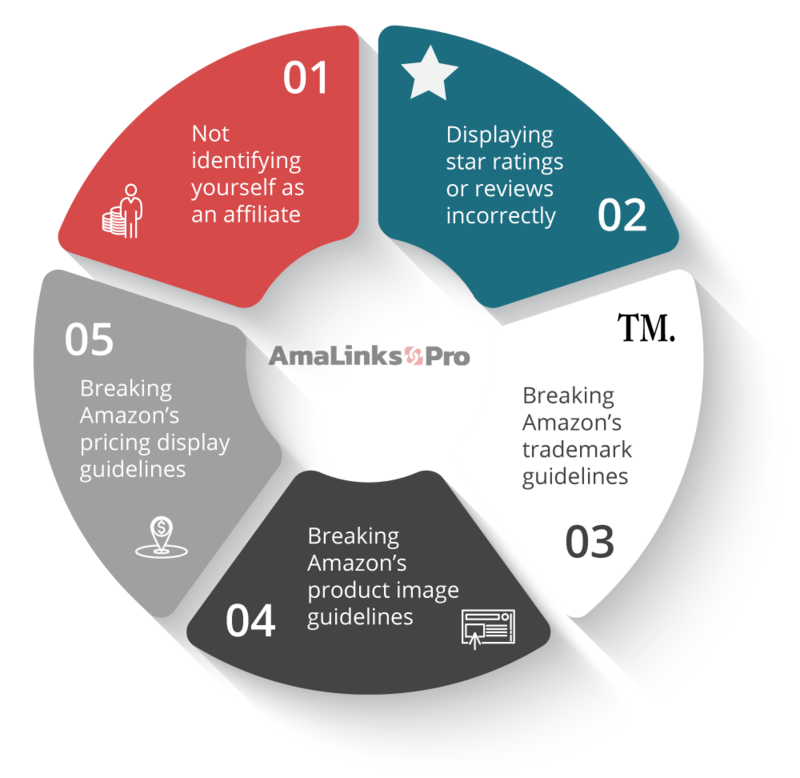 Even if you’re not using AmaLinks Pro to easily insert your Amazon affiliate links – we hope the information in this post serves as value for you in keeping you from getting banned from Amazon Associates.